Before being displaced by diesel engines, horses, mules and donkeys in traction (and more rarely cattle) pulled heavy barges along the towpaths that run along waterways. In France, rivers and waterways were called on very early on to play a major role in the country’s social and economic life, and boating took on a significant role early on. These were in fact ideally suited to transport merchandise at a time when actual land routes were quite rudimentary. Numerous canals would subsequently be dug, linking these waterways to improve the navigation system put in place by nature. Towing with a person in harness, which is particularly economical, remained in use until the end of the 19th century, after was put in place the Freycinet programme (Law of August 5, 1879) which led to a standardization of the locks which made possible navigation by 250-300 tonne boats (this type of barge which was moved 700-800 metres by a single man in an hour, was moved at a little more than 2km/h by a pair of horses). In terms of comparison, the “Berrichon” barges which navigated the Canal du Berry, Canal d’Orléans and the Loire, carried 70 to 80 tonnes for a length of 28 to 30 metres. They were towed by two men, women, sometimes children and often donkeys. In applying the regulations of the 1875 decree, towing using a breast collar was forbidden by the prefects on most canals. The harness used by pulling gorses, as shown in the Encyclopédie written by Diderot and d’Alembert and published in the second half of the 18th century, differs little from the one described by Jean-Jacques Marquart who gathered in 2002 the personal account of a retired mariner: “The horses wear a particular harness which generally includes a bridle with blinders, a straight bit, a collar with wooden shafts of either “central France” or “Flemish” style, of the Beljantoine brand manufactured in Reims, sometimes, for the horse walking along the bank, a large pack-type pad on which a rider might sit side-saddle, a crupper, and breaching with long rope traces carrying a swingle tree […]. For a single horse pulling a Dutch-type Fluyt, short rope traces attached to a swingle tree that was carried high behind the horse’s tail, called “arse-hitter”, a waxed cloth fixed to the collar, a knife in its sheath to cut the rope or traces in case of danger, a 50-60m long towline called “pulling” in canals, or a 100-120m long rope called “maillette” that was tied to the top of the mast. The harness as a whole is decorated with many copper nails, rivets, plaques and bells and red pompoms”. The horses normally work in pairs, that is two together led by a driver. In his 1899 Cours de navigation intérieure (Course in Internal Navigation) for the Ecole nationale des ponts et chausses (France’s leading civil engineering institution), De Mas divided these horses into three categories: Those who belonged to the boatmen and who were housed on the boat, those who were rented by drivers or farmers, who were called “long-day pullers” and who would do several legs with the same boat, and those who were regrouped at organised relay points, either by industrialists, or the state or its dependents. Depending on the people and the waterways that were being travelled, the average value of the journey varied between eight and 12 km per day (0.50m/s at a good walk) for human traction on a boat carrying between 80 and 150 tonnes (mixed pulling with a man plus a donkey housed on board, used for small boats on the Canal du Berry, upped this speed by 2-3 km), 20 to 30km per day (1m/second) for pulling by horse boats carrying between 100 and 275 tonnes (35 to 40km for pulling speeded up by the use of two horses with day/nigh relays, and 48 to 60km per day (4 to 6km per hour depending on the load) for day and night steam services. 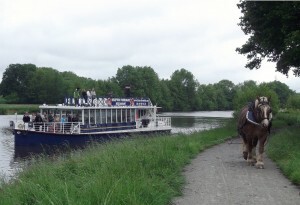 In the Seine et Marne region, horse-powered towboats have come back into favour through Yprema. Established in 1989, the company YPREMa selects, transforms and adds value to the dismantling of materials and carries out solid waste incineration. 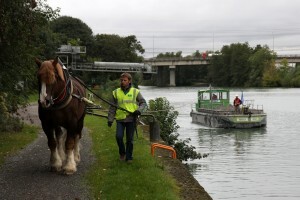 Since October 2004, having convinced the autonomous port of Paris, which owns the riverbanks, to refurbish the towpath to make extraction easier, the waste produced at the Saint Thibaut Les Vignes incineration plant (solid waste) is taken to the Paris area Yprema location using a barge that is pulled by two Breton draft horses. Built using recycled aluminium, Yprema’s barge, christened “Rosily”, is 20m long and 4.5m wide, and it can transport up to 80 tonnes of solid waste. Pulled by two horses, the journey along the bank lasts 10-15 minutes, at a speed of 5-6km per hour depending on wind and currant. Carried out twice a day, five days a week, this initiative has resulted in the elimination of seven daily trucks, a reduction in noise pollution and harmful emissions as well as the risk of accidents. This action, which is part of an industrial ecology project, has enabled the creation of a closed circuit industrial park on the banks of the Marne river. In its guide book on putting in place an ecological industrial action inside a business park, L’Orée (a research organisation on children and the environment) confirms the environmental benefits of this whole approach: River transportation of Sietrem’s solid waste (35,000 tonnes per year) yields a saving of 1350 trips by a 25 tonne truck. Furthermore, the removal of drained water will eliminate the need for tanker trucks. The system as a whole will allow the elimination, on average, of seven truck journeys per day, meaning a reduction of 56 tonnes per annum in CO2 emissions. To ease the burden on the horses, two auxiliary engines are used to more the barge away from the bank so that the horses can start pulling gently. In order to prevent any consequence of pulling on an oblique line, the two Breton horses are looked after carefully and are lunge-worked with corrective exercises, driven with a vehicle or ridden. They are boarded at the leisure base of the UCPA (National Association of Outdoor Sports Centres). Towing in Vannes Harbour during the “Mille Sabots en Pays Vannetais” festival: people can see the towing of the famous Singao (small sailboat that is typical of the Port of Séné). L’Hirondelle, in the Loire Valley, is a leisure restaurant barge which also offers towing demonstrations. It is 26m long and 5m wide, and can navigate on either the Mayenne, or the Maine at Angers and, starting in 2000, on the Loire up to the island of Béhuard. On the Ourcq Canal, there are guided tour cruises with a portion using animal traction that lasts about one hour, starting at the Bassin de la Villette in Paris, and offered for tour groups by the Canauxrama company on weekends in July and August. 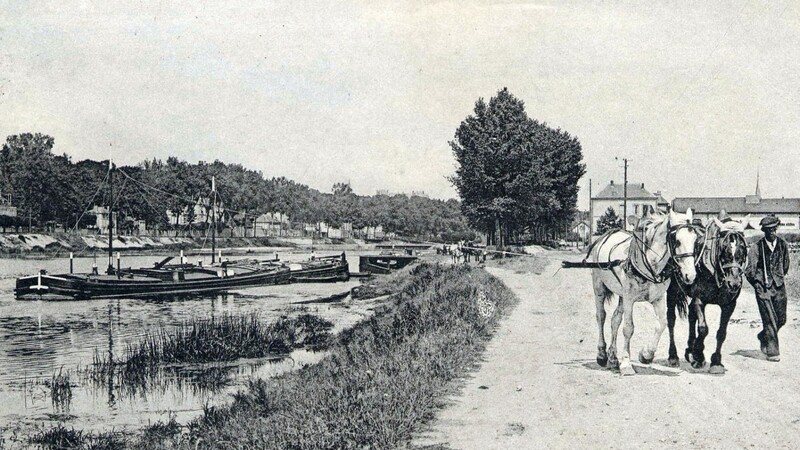 In 2011, the organisers of the Rendez-vous de l’Erdre in the Pays de la Loire (annual get-together which combines jazz and pleasant boating on the banks from Versailles to Nantes) organised a prologue with a donkey farm (Aux Ånes). On that occasion, five Belugas (small yachts with sais) were towed between Redon and Nort-sur-Erdre by donkeys. At the Festival de Loire organised every two years in Orléans, demonstrations of the towing of boats by Ardennes horses were offered every day. Also to see was the loading of horses onto the Chêne Rossignol, a “Horse Transporter” designed to transport animals on the river. The Anglo-Saxon Model: This concept has sadly not yet found in France the place it would deserve, and the time given over to towing by the few riverboat cruises that offer it is still minimal. Our animals have a much greater work capacity than what is asked of them, and it is always possible to assist them using a small auxiliary engine for the hard parts. Is this a cultural problem? In Great Britain, the Horseboating Society, which was set up in 2011, has a thousand members and organises numerous events on the theme of towing and horses every year. It works towards the conservation of the know-how linked to this practice, the training of boatmen and their horses, the upkeep, restoration and the use of waterways that can be used by horses, the preservation, restoration and upkeep of the different types of boat towed by horses, educating the public, etc. About half a dozen companies also offer horseboat excursions on the country’s various waterways. On the other side of the Atlantic, in the United States, numerous offers are made to the public. As opposed to Great Britain where the towing is done almost exclusively with horses, in the United States, large mules that are crosses between Mammoth Jacks and Belgian draft horses are used by horseboating promoters to that end.